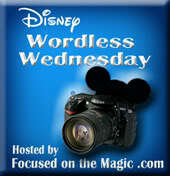 It's Wednesday again, and that means another great set of photos with the Focused on the Magic Blog hop! Click the button on the bottom to see more. I might be a weirdo, but I LOVE the Disney Junior show at Hollywood Studios. Our first trip we saw it once, our second trip, twice. This last trip, the shows were all canceled our first day for technical difficulties (I'm guessing the book wouldn't turn? I mean...the cast is puppets) but on our last day, my youngest and I got to see it. The oldest was a little sad, so hoping next time we can all see it. I love the songs, (Yes, I do have the Jake and the Neverland Pirates and Doc McStuffins soundtracks and darn tootin I know the words!) and I LOVE LOVE LOVE when they drop the bubbles, the gold doubloons and the streamers from the sky!! It's sooo fun!! We have a little pile of them as souvenirs. It's so awesome now that the meet and greet for the Disney Junior gang is right nearby. My youngest fell in love with Sofia on this last trip, and he was too shy to meet her, but he did go to Jake, Doc and Pluto. Do you have a favorite Disney Junior character? My kids are older now, but we never did see the Disney Junior shows when they were younger. Looks like a lot of fun! They are super fun!! That's why I love Disney...adults can be kids too! It's so much fun! My kids are older but when we went with little ones we had a blast. I'm glad you've gotten to see it! They really go all out to make it special! We have a Disney Junior show like this in Paris but it still has older Disney Junior Shows featured and needs a reboot. My son would love to see Jake! Oh I bet it would be fun to see the one with some of the older shows! We don't have cable, so my youngest enjoys a lot of the older shows more, like Little Einsteins.